These look pretty darn good. I amm fine with dark meat leftovers but i think I will do this anyway for the heck of it! OMG! Can I come to your house? I always wind up scarfing down the dark meat quarters from roast chicken, and I'm stuck with the white meat! It usually becomes very meaty chicken soup. Match made in heaven! 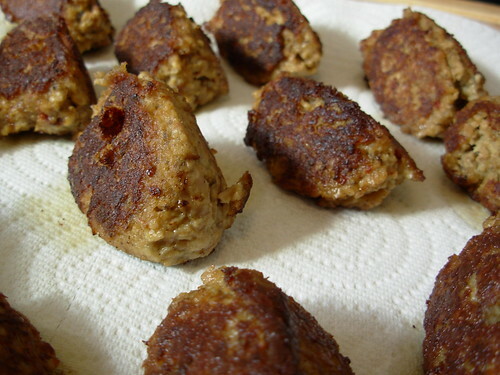 The croquettes look tasty, but since I hate mushrooms, I'd probably use nuts for that part. Flowerdew - I don't particularly care for mushrooms either, but you can't taste them in this at all. I do the same thing with meatloaf and the mushrooms just kind of disappear into the meat and somehow give it the same texture that bread crumbs do. It's a mystery of science, lol. I've made these several times - very satisfying! I add a little almond flour in place of the mushrooms, and roll them in a little almond flour before I fry them. I'm having them tonight!